Common Crash Injuries Bicycle Riders Suffer | DeLoach, Hofstra & Cavonis, P.A. The benefits of riding a bicycle are seemingly endless. Riding a bicycle can save on gas by cycling to work, maintain a healthy weight and reduced blood pressure, and make the most of summer activities by riding with friends and family. While there are many reasons to begin riding bikes, however, there are also cons to riding a bicycle. The top threat to cyclists nationwide is other vehicles on the road—and the drivers who might not want to share the lane. Head injuries. Head injuries range from scrapes on the head to a fracture of the skull, either of which, may cause a brain injury to develop. As a result, Florida law requires bicycle riders and bike passengers under the age of 16 to wear a properly-fitted, federally-approved bicycle helmet for all rides. Traumatic brain injury. Brain injuries are one of leading causes of death for injured bikers in the United States. Riders may sustain a brain injury without suffering any visible injury to the head, such as a concussion or another form of closed head injury. A traumatic brain injury can cause many different symptoms, including memory loss, mood swings, interrupted bodily function, or even permanent mental and emotional changes. Facial injuries. Bicycle accidents can result in significant damage to the rider’s face, including lost or broken teeth, a fractured jaw, eye or vision damage, a broken nose, or road rash that causes permanent scarring. Bodily trauma. Nearly all bikers will suffer musculoskeletal trauma, soft-tissue injuries, after a crash. A rider struck on the back wheel may experience whiplash, while a biker hit on the side may experience a broken leg or torn ligament in the knee joint. Riders who attempt to “brace” for a fall after a collision can dislocate their shoulder or break their hands and wrists as they strike the pavement. Severe trauma can cause broken ribs or internal bleeding. Back injuries. Bikers who are struck with extreme force may land on their backs or roll after a crash, causing damage to their spinal columns. Severe trauma to neck and back may result in herniated discs or damage to the spinal cord, which can lead to paralysis. Death. 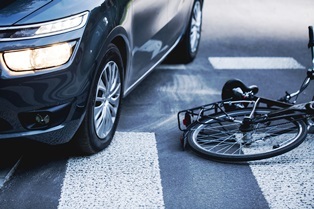 Many factors can increase the odds of a bike accident becoming fatal, including speeding, distracted driving, alcohol use, and unsafe road conditions. If someone you love was killed in a bicycle accident, you should speak to a wrongful death attorney as soon as possible. When a person is injured in this type of crash, it's important to have the incident investigated as soon as possible. There are many different parties who may be held liable for the costs of the victim’s medical care, lost income, emotional trauma, and any other long-term damage caused by the crash. Since biking injuries often require extensive treatment and rehabilitation, it's vital that victims examine all of their options carefully. Our legal team knows how to approach bicycle accident cases to get victims maximum compensation. We take over the legal investigation, ensuring that insurance companies pay for the full extent of your injuries and losses. We keep you constantly updated as your case progresses, allowing you to take the time you need to heal. Best of all, we cover any fees and only collect payment for representation once you are awarded a verdict or settlement. Simply fill out the form on this page today to make an appointment in our offices.